China has slapped a tariff on U.S. pork and pork products. “You know, American farmers literally feed the world,” says Joyce Kelly, executive director of the Colorado Pork Producers Council. American pork goes to a long list of countries, though primarily to Canada, Mexico and China. Kelly says the tariffs will mean that a lot of pork previously destined for China will instead stay here in the U.S., flooding the market and making pork even cheaper than it is already. “And then basically farms are going to have to evaluate whether or not they’re able to stay in business anymore,” she says. China’s State Council Tariff Committee put a 25 percent tariff on pork products and 15 percent on fruit, effective immediately. The move has producers like Jarom Jemmett worried. “When a trade war starts, you never know where it’s going to go or how long it’s going to last or what other industries it’s going to affect,” says Jemmett, who is vice president of J&S Farms in Idaho’s Treasure Valley. He grows things like onions, potatoes, corn and wheat. Those products aren’t targeted by the Chinese tariffs, but Jemmett is nervous about a potential domino effect. “It may start with pork and apples and then expand into beef, and potatoes and onions,” he says. 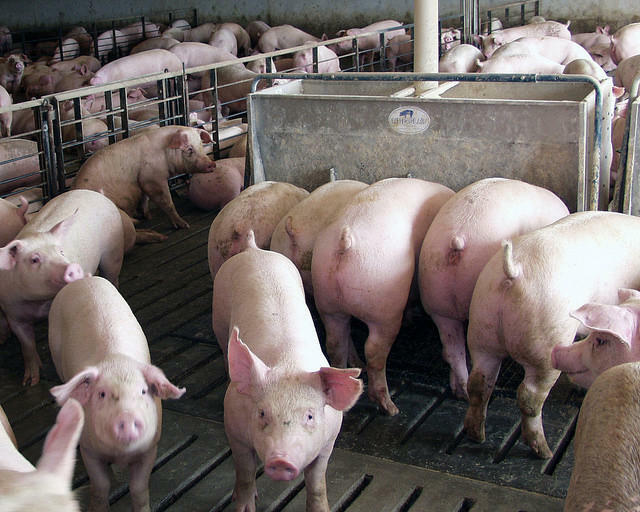 In the meantime, says Jemmett, tariffs could drive down the price of pork, which could drive down the price of the corn and wheat that feeds those pigs, which could in turn hurt farms like his. Jemmett voted for Trump, but he says certain moves by the administration -- from its stance on immigrant labor to starting this trade war -- are making his line of work even tougher than it was before.